joy magnetism: Happy 200th, and thanks! Happy 200th magnet! The internet gurus say that the majority of bloggers abandon their blogs within 3-6 months of starting. So, yay for me! 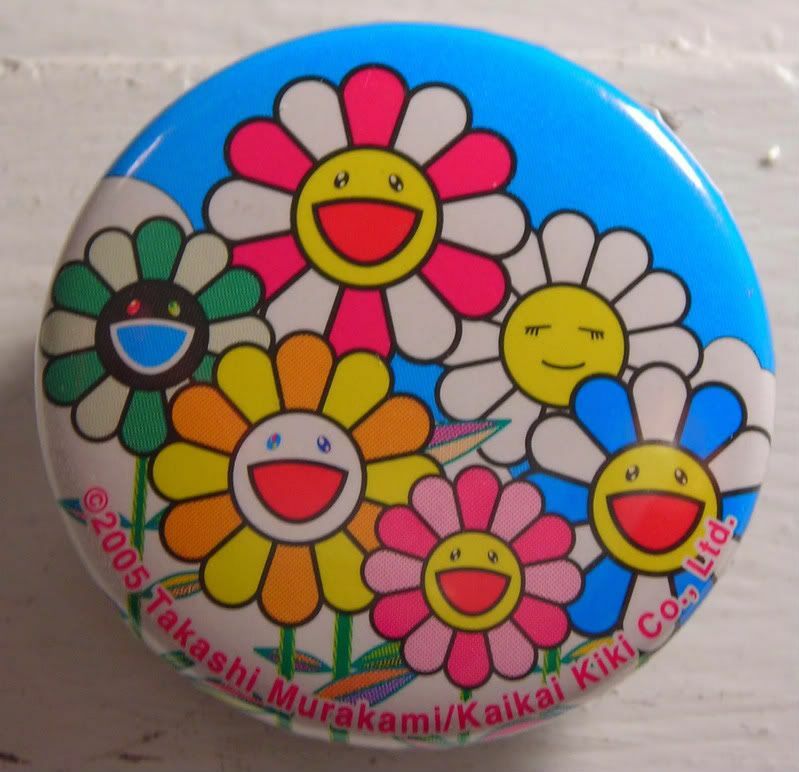 Today's pin/magnet is Takeshi Murakami's Flowers, for two reasons. 1) Because c'mon, how cute are these flowers. I saw Murakami's work at the Brooklyn Museum of Art earlier this year, and really enjoyed a lot of his work. The flower room was overwhelmingly dizzying, with flowers on all four walls, plus the giant flower sculpture in the middle. Just amazing. My favorite part, was the cellphone description for it, where Murakami says he deliberately included some flowers that aren't smiling...because he thinks kids should know that the world out there isn't all happy and shiny. 2) Because it's a rather cheerful image which reflects my mood today. I just wanted to thank everyone from around the world who has stopped by to visit (and post) on joy magnetism. I appreciate it very much. So far, I've had visitors from almost every continent. Thanks to my handful of regular readers for taking time to read about this weird little magnet collection of mine and the oddball stories that go along with it. And, thanks to the random blogsearch drop-bys. I have to say that though it's been great to catalog my magnets, on a marketing professional level, blogging has given me tons of insight into the bloggers' mindset. Plus, it's allowed me to see some of the organizations who are clearly on top of their blog monitoring. It's been an interesting ride, thus far. Of course, I'm still waiting on someone from Antarctica to visit my blog...oh, and someone from bbc.com. And georgeclooney.com. And davidtennant.com. PACEY'S BACK ON TV TONIGHT!!!! Eeeeeee!!!!!!!! What? I know he hates being known as Pacey. I don't care. It's cause for celebration! Joshua Jackson's gonna be on my TV in Fringe every week! Well, at least until FOX screws it up. Watch Fringe! It'll be awesome. And even if it won't be, it's Pacey! And you just cannot go wrong with having Pacey back on screen. I feel like JJ's publicist. Of course, I'm doing the same thing with George's Burn. And we think they're rude?